Hey everyone! We are so thrilled to announce the tour schedule for Marni Bates' DECKED WITH HOLLY Blog Tour. We had some amazing bloggers sign up and we are so sorry we couldn't choose everyone! The tour runs from December 31st, 2012 - January 4th, 2013 and January 7th - 11th and includes a mix of guest posts, author interviews and reviews. Each stop will host a giveaway for a copy of the book, so be sure to visit each of the stops for more chances to win. Feel free to grab a badge or button to post in your sidebar! 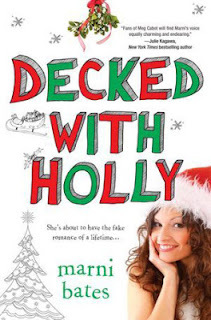 Taking a Christmas cruise with her two cousins from hell isn't Holly's idea of a good time. And when seasickness forces her into an open suite, she's pepper-sprayed by a gorgeous guy called Nick. But when Holly makes her exit, she's greeted by a horde of screaming teenage fans. Because Nick happens to be Dominic Wyatt, drummer for one of the hottest bands in America. Suddenly rumours are swirling and Holly's face is plastered all over the Internet. The band can't risk a scandal destroying their family-friendly image, so Dominic convinces Holly to be his fake girlfriend - just for two weeks.